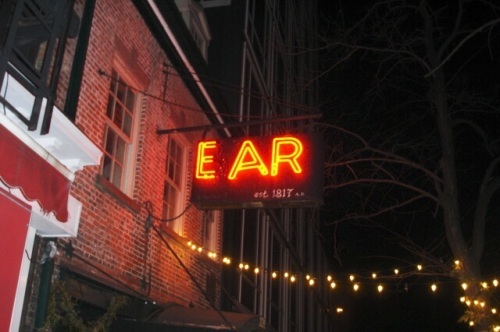 The Ear Inn, as I have been pointing out for a number of years, is the place to be on a Sunday night in New York City. When you come to 326 Spring Street in Soho, sometime between 8 and 11, you will hear wondrous music, subtle and exuberant. A few Sundays ago, on September 16, 2012, the EarRegulars were Jon-Erik Kellso, trumpet; Harry Allen, tenor saxophone; Neal Miner, string bass; Chris Flory, guitar. That group in itself deserves a WOW! After a brief break for nourishment, the Original Four took the stand (a figure of speech at The Ear Inn) for a leisurely, I might even say “lingering” version of LINGER AWHILE. Savor the beautiful solos and the way each solo leads into the next — this is a band of individualists who know all there is to know about Swing Synergy. This performance is a living lesson in craft, courage, and heart. I think it takes a lifetime to learn how to play music like this; aren’t we lucky that these players and their friends share their masteries with us? “My goodness!” to quote Dan Barrett. I don’t know of another place on the planet where such collective exultation takes place on a weekly basis . . . . thank you, gentlemen, for making this joy possible (and for allowing me to spread the healing vibrations to people who live far away). P.S. I must also say that what and how a band plays is in some small measure determined by their audience. It is entirely possible, and sometimes necessary, for musicians to ignore the loud or distracting people in front of them . . . in fact, if musicians got distracted from their life-purpose by the couple at the table near the window, they wouldn’t last very long in this business. But I digress. At the Ear Inn that night, there were many musicians and deep listeners in the audience, and I am sure this made the atmosphere even more special: Gary Foster, Frank Basile, Ben Flood [players!] and Lynn Redmile, Shelley Finke, Nan Irwin, Claiborne Ray, Marcia Salter [listeners!]. P.P.S. After five years of fairly steady attendance at The Ear, I feel that it is a beautifully special place in my world. It’s where I go to wash away the dust of everyday life, to get my aesthetic vitamins, to get my batteries charged. This may be too personal for some of my readers, but I write openly that 326 Spring Street on Sundays from 8-11 is my synagogue, my church, my mosque, my sacred space, my place of worship. I go there to get uplifted, to witness and participate once again in individual and collective Joy. I go there to learn so much about beauty and generosity. I wish that everyone who vibrates as I do could go there and be inspired. And I do not overstate a word here. Sadly, Dan Barrett is flying back to California as I write this. I know he’ll be happy to be reunited with Laura and Andy, but we’ll miss him here terribly. In the past ten days, he’s done a number of club gigs, a concert, a private party, and maybe some other playing I missed. I couldn’t follow him around as much as I would have liked, but I did catch him on video on three occasions — twice at The Ear Inn and once at Arthur’s Tavern with Bill Dunham’s Grove Street Stompers. Highlights of those three glorious nights are a-coming! I don’t know when Dan touched down in New York City, but after a triumphant jazz afternoon playing alongside Dan Levinson, Dan Tobias, Keith Ingham, and Kevin Dorn in celebration of Ray Cerino’s ninety-first birthday party, a joyous event, Dan (after a nap) made his way downtown to that Soho salon of swing, The Ear Inn (326 Spring Street) for another Sunday extravaganza with The EarRegulars. Here are several performances, featuring the charter co-leaders Jon-Erik Kellso (trumpet) and Matt Munisteri (guitar), with Joel Forbes (bass) and several esteemed joiners-in. The PENNSYLVANIA JAZZ SOCIETY will present their annual JAZZFEST with a TRIBUTE TO BENNY GOODMAN on Sunday, July 11, 2010, from noon to 5:30 p.m. at the Plainfield Township Fire Company Hall, 6480 Sullivan Trail, Wind Gap, PA 18091. The two bands featured that day are THE MIDIRI BROTHERS and DAN LEVINSON’S PALOMAR QUARTET. The Midiri Brothers will play from noon to 2:30 p.m. Their group is Joe Midiri on clarinet, Paul Midiri on vibraphone, drums, and trombone, Dan Tobias on trumpet, Pat Mercuri on guitar, Steve Kramer on piano, Ed Wise on bass, and Jim Lawlor on drums.